Leaning on the Everlasting Arms: Eagles, Girl's Night and Learning to Soar. Eagles, Girl's Night and Learning to Soar. "Once a year the female eagle lays an egg in a nest high over a bluff, inaccessible to predators. For the six weeks following its hatching, the eaglet has it "made in the shade": He can see lots of things from his vantage point. He's fed hourly by his mother. Life is easy. By week 5 he has grown quite large. Then something begins to happen. Unbeknownst to him, his mother designed the nest in such a way that sticks point inward (!) So as the eaglet gets fatter, the sticks start to poke into him. The eaglet probably wonders why the mother didn't make the nest more comfortable---never realizing that its design was all part of the plan to get him to do something he would never have done otherwise---step out of the nest. 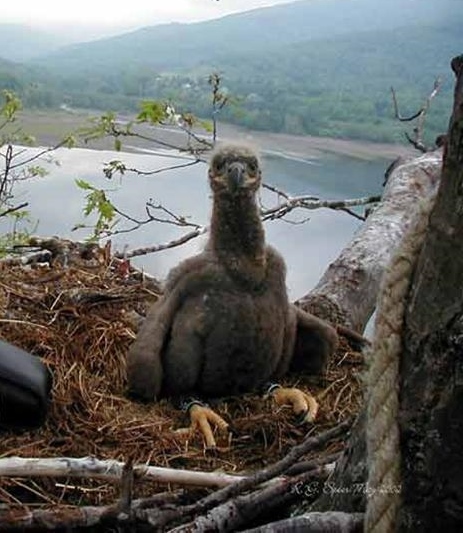 One day around this time the mother returns to the nest and with her eight foot wing span and knocks the nest, bumps it, and rattles it until until the eaglet falls out and tumbles hundreds of feet toward the ravine below. Feathers fly, the eaglet squawks, the ground gets closer, the rocks bigger---then the mother swoops under the eaglet, scoops him up on her back and drops him back into the nest. "Whew!" the eaglet thinks. "Mom needs to be more careful flying near the nest." But three days later the mother eagle stirs the nest once again sending the eaglet screeching and tumbling to the rocks below. And once again at seemingly the last minute she swoops underneath him and carries him back to the nest. The whole process is repeated over and over until about the 6th or 7th try the eaglet catches air in his wings, flaps them powerfully and....soars." Our Women's Bible Study ("Girls Night") is like this eaglet. I started the group about 6 years ago with a nudge from God and some selfish motives. After coming to Belize I missed my Friday night fun night with friends. We almost always went out to a restaurant to relax and gab after a long week of work. I missed that here. Also my house was becoming a full time restaurant. Four times a week someone was coming over to my house to "talk" right at meal time. So I invited them in and shared dinner with them. I started thinking, what if I said this "restaurant" is open on Fridays, come, bring your female deaf friends and we will eat and Bible study together. That way I could gain a little control when I had visitors for a meal and could have a Bible study for deaf women on my previously boring Friday nights. What a plan! This worked well and like eaglets they had it "made in the shade". I did all the cooking and Bible study planning. All they had to do was show up and help with the clean up. Yet there were these spikey sticks poking us: Our group has tripled in size. Many of the women have children. On a given night we have at least 3 but up to 5 or 6 children "playing" while we are trying to Bible study. It was too distracting. God was nudging us to move on. Our Bible study couldn't go on like this forever. How do I make it sustainable, I wondered...for several years....but didn't make a major change--until last week. It was time to jump out of the nest. Yikes! Before we began the Bible study I raised the issue and provided this solution: What if we met during the day while most of the children are in school? Several nodded that was acceptable. We tossed around the pros and cons (chief among them being we would meet from 1-3 PM ...no food). On our first Wednesday afternoon meeting we sat down and actually got to dig into the Word. It was good. It was relaxing, it was working. But there were murmors about missing the food. I offered carefully, "Let's meet the First Friday of the month just for fellowship. We can all eat together, bring the kids. We'll do something fun like make a craft, or play games, or have a pampering night painting each other's nails. Everyone relaxed a bit. I got lots of nods of approval. (BUT I did not want to jump back into the nest again... we had to learn to fly...) So I added, "Who will bring some food for the first Friday Fellowship?" Shoulders slumped and a brave few asked, "You mean you are not going to cook for us?" I am not the "mother" of this group, but I understand the mother eagle must have hurt a bit when she saw the eaglet falling and feeling "I can't". At the same time she knew, he could. I KNOW these women can share the responsibility of bringing the food. But we'll take baby steps. I asked, "What can you bring? I'll provide what you can't." Angelica said she could buy bread (pan dulce... deicious varieties of sweetbread rolls) for everyone at the bakery. Terrific. I offered to make a fruit salad and bring some cheese. We're not soaring, yet, but were out of the nest. We had a fun time. The children wandered and played but they weren't a distraction because it was casual. It was just fun to be together and felt relaxing to chat. It also helped to have Brittany choose to entertain Kristen. I know Kristen loved Brittany's goofiness At the end of the First Friday Fellowship last night I asked who would bring food for the next month's meeting. Kristel said she could bring the bread. Alva offered her mother to bring tacos for the following month, others thought they could bring tortilla. Thank God for those spikey sticks in the nest. Without them we would never have chosen to try to fly. Brittany and Kristen goofing around. Martha is such a happy person. Her stories are so funny. She has us all in stitches.